Do you own an Android smartphone? If yes, then you are one of those billions of users whose smartphone is secretly gathering location data and sending it back to Google. Google has been caught collecting location data on every Android device owner since the beginning of this year (that’s for the past 11 months)—even when location services are entirely disabled, according to an investigation conducted by Quartz. This location-sharing practice doesn’t want your Android smartphone to use any app, or turn on location services, or even have a SIM card inserted. All it wants is to have your Android device to be connected to the Internet. The investigation revealed that Android smartphones have been collecting the addresses of nearby cellular towers, and this data could be used for “Cell Tower Triangulation“—a technique widely used to identify the location of a phone/device using data from three or more nearby cell towers.Each time your Android device comes within the range of a new cell tower, it gathers the cell tower address and sends this data back to Google when the device is connected to a WiFi network or has a cellular data enabled. 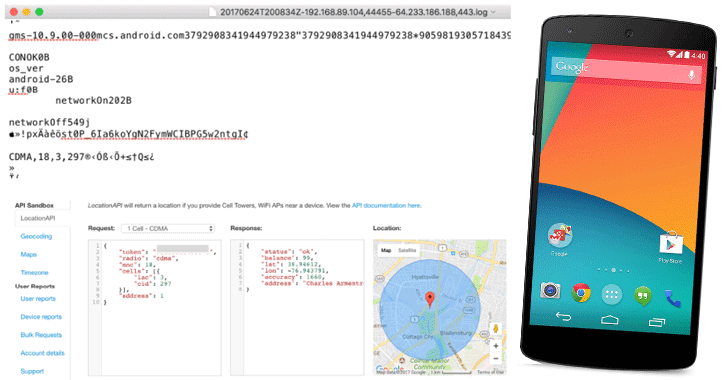 Since the component responsible for collecting location data resides in Android’s core Firebase Cloud Messaging service that manages push notifications and messages on the operating system, it cannot be disabled and doesn’t rely on what apps you have installed—even if you factory reset your smartphone or remove the SIM card. Although it is still unknown how cell-tower data that helps identify a specific cell tower could have been helped Google improve message delivery, the fact that the company’s mobile operating system is collecting location data is a complete violation of user’s privacy. Moreover, this location-sharing practice is not limited to any particular Android phone model or manufacturer, as the tech giant was apparently collecting cell tower data from all modern Android devices before being contacted by Quartz. Although the company said that it never used or stored this location data it collected on its users and that it is now taking steps to end this practice, this data could be used to target location-based advertisement when the user enters any store or restaurant. According to Google, Android phones will no longer gather and send cell-tower location data back to Google by the end of this month.